When your customer speaks the wake word "Alexa", they'll want an indicator that your product heard them. This may be an LED activating or changing color on the device. But what if your customer puts your product up on a high shelf, around the corner, or somewhere they can't see it? Maybe there just wasn't a good place on your product to put some LEDs? In this case, you may want your device to play an audio cue to confirm when Alexa recognizes the wake word. Amazon provides an Alexa Sound Library for you to use when designing your product. The Sound Library contains three different sound sets, each targeted to a different speaker range. In this step, you'll modify the User Interface Manager to play a Wake sound each time Alexa's state changes to LISTENING. First, you'll need to download the Alexa Sound Library. From your AVS Dashboard, click on your Resources tab next to Analytics Dashboard under your Alexa Voice Service link. 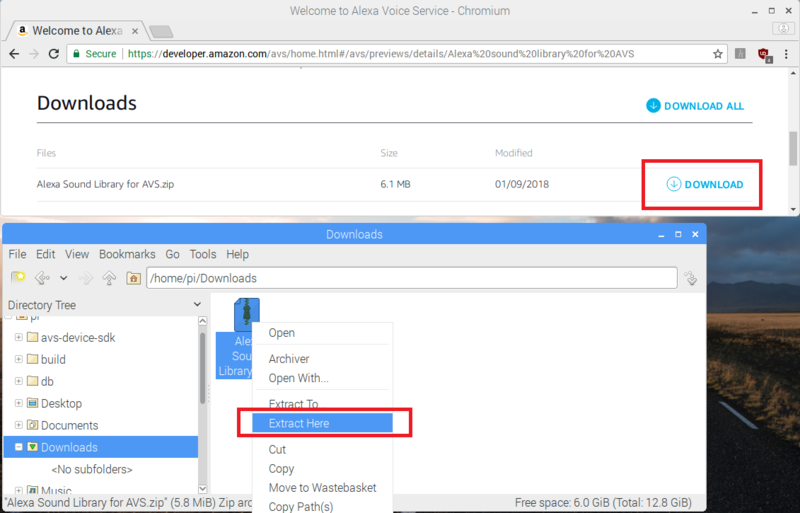 Scroll down until you see the Alexa Sound Library for AVS line, then click "Download" to get the library onto your Pi. Navigate to your /home/pi/Downloads folder in the file explorer, and right-click on the zipped archive and select Extract Here. Now, you have local copies of the key sounds you'll use to inform users of your product state. Open the Alexa Sound Library for AVS folder. In it you'll find three different sound sets - ful, med, and sml. Each set corresponds to a specific speaker quality range. For more information, see Alexa sound library. In this tutorial, we will use the med sound set, however, you can use whichever one you'd like. Change directories to the med folder, and copy the file med_ui_wakesound.wav. Paste a copy of this sound into your /home/pi/sounds folder - this is the path we'll point to later when we're ready to play the sound! Note: If you still have your Alexa sample app running, quit the application or close the terminal window before you begin editing the SDK source code. In the File Manager, navigate to /home/pi/avs-device-sdk/SampleApp/src/ and open UIManager.cpp with a text editor. Near the top of the file where you see the other #include statements, add #include <cstdlib>. This will enable the play function that you'll add in the next step. Every time you speak the wake word "Alexa" to your prototype (Alexa's state changes to "Listening…") you should hear the wake sound play, indicating that your client device has opened a channel to the cloud. If you initiate a multi-turn interaction, you'll also hear the sound when Alexa is awaiting your answer. In the terminal window, you'll see the following message when your sound clip is successfully played. Have fun modifying the UI Manager on your prototype - feel free to get creative and experiment with different sounds at various states. Share what you've built by sending us a link via the feedback button! Note: Keep in mind that when you ship your commercial products, your customers will expect their experience to be consistent across all of the Alexa-enabled devices they interact with. Learn best practices for implementing visual and audio cues on your device by visiting our AVS UX Design overview page. Ready for more Advanced Pi tutorials? Click the Next button below to learn how modifying your Alexa Focus Manager Library can enhance product-specific use cases!